Our heads are still exploding thinking about how Samsung reinvented its smartwatch line with the introduction of the Gear S2. The all metal sci-fi look is no doubt impressive on many fronts, but not everyone will be a fan of its peculiar styling. Well, for those who still have their hearts set of a traditional timepiece design, Samsung keeps the tradition going with its alternative model – the Samsung Gear S2 Classic. The Classic is a stark contrast to the standard Gear S2, seeing that it looks and feels like an ordinary, mechanical time piece. Therefore, if you’re a traditional type of person, the Classic’s mechanically influenced design ensures you’ll still have it. The point is made more poignant looking at the type of material used for its casing, one that opts to go with a stainless steel polished finished to give it that reflective quality – as opposed to the brushed finish of the Gear S2. Smaller details found on the Classic, like the gear tooth cutouts lining the outside of the rotating bezel, as well as the accompanying leather strap, all combine to give the Classic that distinctive timepiece elegance. While its design is perfect for casual wear, we really hope they come out with some other, more premium bands – like a metal linked style of some sort. Still, we should point out that the Samsung Gear S2 Classic actually carries a smaller footprint than its sibling. Therefore, if you have extraordinarily large wrists, the Classic can appear under sized. Between the two, however, we still have to give the standard model more style points. Thus far, most smartwatches rely on the touchscreen for navigation. Apple, most recently, popularized the notion of using a crown as yet another way to navigate and interact. Samsung, on the other hand, opts to go with a unique spin with the Gear S2 (and Classic) by employing a rotating bezel around the display. Our biggest concern heading into it was the rotating bezel, whether it was going to be too sensitive or unresponsive. Luckily, Samsung did it just right by offering enough fluidness with its operation. Armed with a 1.2-inch 360 x 360 Circular Super AMOLED display, it’s certainly quaint in size in comparison to the round displays on some other smartwatches. For example, the larger version of the Moto 360 is accompanied by a 1.56-inch display, while the Huawei Watch comes with a 1.4-inch one. Regardless, we like its size and definitely takes equal precedence to the Gear S2 Classic’s overall design. 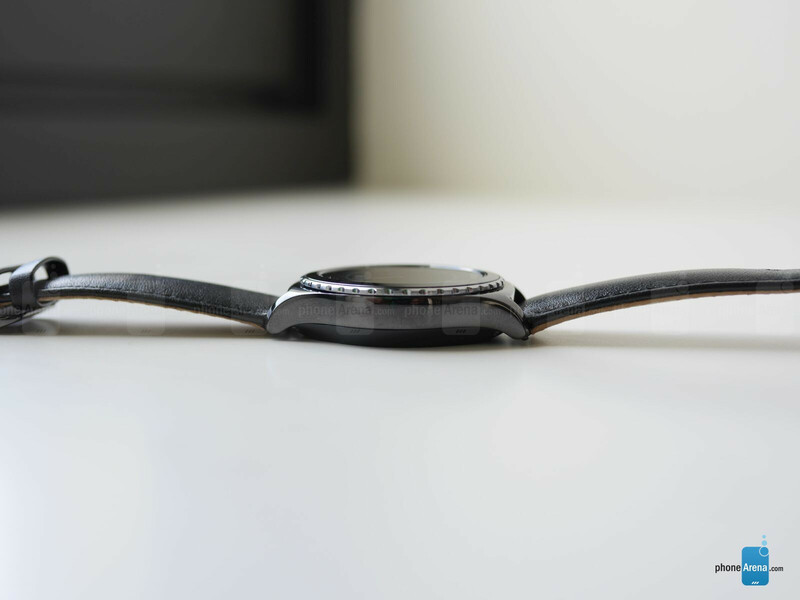 Being Super AMOLED, you get that perfect black color reproduction, so when it’s displaying a watch face, it can sometimes appear to be mechanical – albeit, we know that we’re dealing with a digital one of course. One of the biggest concerns going into something like this is the Tizen interface that’s used to propagate the experience. Anyone familiar with Samsung’s past Gear offerings will notice how this one is influenced by them. For example, apps like the calendar and weather look like they’ve been ripped from its previous smartwatches. Still, the rotating bezel is optimized to work in conjunction with what Samsung calls the “rotary” UI. Basically, some of the core apps and functions of the Gear S2 Classic are accessed by either using the rotating bezel or just swiping on the touchscreen. Honestly, every action is accompanied with an instant response, so using the rotating bezel for navigation is just as effective as the touchscreen. Of course, there’s also the concern the diversity of apps with the ecosystem. There’s nothing to be alarmed about at the moment, just because Samsung ensures that there will be over 1,000 apps available at launch. We even managed to check out a couple of them in our meeting, such as Uber. And interestingly enough, all the apps are run natively through the smartwatch, so there won’t be any nagging issues about how some other smartwatches are faced with latency issues trying to access data on a smartphone. As of right now, Samsung says that the Gear S2 line is compatible to work with most Android 4.4+ devices with 1.5GB of RAM. Certainly, that can be viewed as a limiting thing, but we can imagine that wider support will be available down the road. Hey, we’re hoping to see expansion into other platforms – like iOS and Windows. Under the hood, it’s powered by a dual-core 1GHz Exynos 3250 processor with 512MB of RAM. Impressively enough, it’s better than some Android Wear smartwatches too, which goes to show the kind of optimizations brought on by the processor and software. In addition to the Bluetooth option, the Samsung Gear S2 Classic offers exclusive Wi-Fi connectivity as well to receive all and any notifications. Being untethered from a phone is a good alternative, but of course, it’s always there if you choose to stick with it. And yes, it comes with built-in NFC that will be used in conjunction with Samsung Pay. We’re told that we can use the Gear S2 Classic independently, without it being connected to a phone, to make payments using Samsung Pay. Usually, our thinking tells us that something that’s designed to look more like a traditional timepiece would incur a higher price point than one that doesn’t. This is something we’re curious about, just because Samsung did not disclose the pricing of its upcoming smartwatches. However, we’re told that the Classic, along with the standard model, will begin to go on sale in the US starting in early October – where carriers will make announcements later on regarding the availability of their models. Maybe the Classic will have a higher price point than the standard model? Or maybe they’ll both cost the same? Whatever the case, if you take fancy in a smartwatch that favors a classical timepiece design, this one undoubtedly hits the bullseye. Tech manufacturers (Samsung, Moto) need to make a industry standard sized smartwatch "device" that can be snapped into universal watch bodies/bracelets. This way, the tech companies can focus on the electronics/device, and the watch/fashion companies can focus on the "carriers". One of the best Smartwatch till date. I prefer the OG Gear S.
I was going for the Gear S2 classic until i saw hands on videos. The Sport version is perfect, and it ll definitely be my next smartwatch alongside the Huwaei Watch. Time to sell my Moto 360. It was ok at times and awful at times. Battery would last me a full day at times, and drain in keleless than an hour at other days. Never was consistent in terms of performance and battery life. But it has been a much much better experience since the last update was pushed 4 days ago. I can easily make it through the day with some juice left in it, and the lag is almost gone. Do you have it? I do. It's not very good. Or are you just talking about the look? The look, I don't actually own one. I'm considering a few offers. The chip in Gear S2 and gear S are same. I guess it' about software improvements. 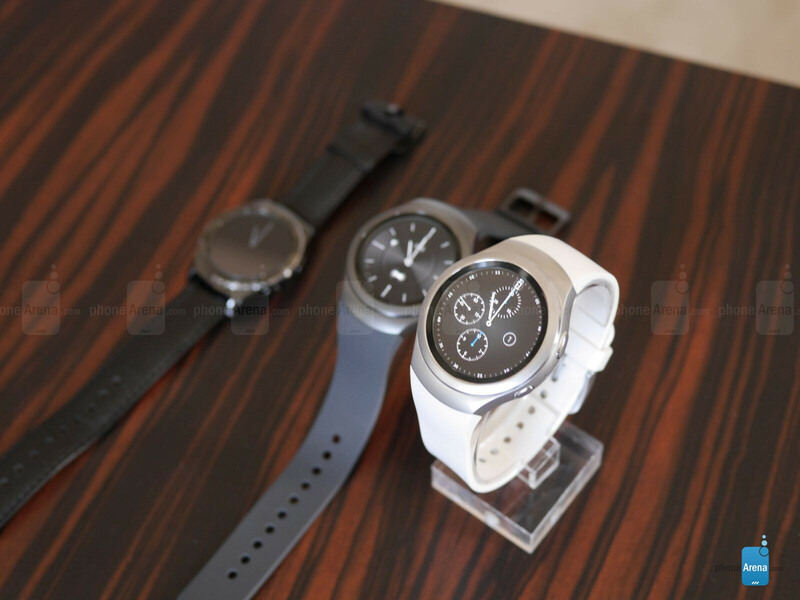 Samsung should update gear S's software, so customers using S will buy may be S3 in future. By far Samsung is leading the pack with this smartwatch it left everyone in the dust including Apple. I must give credit when it's due. If only it had a 1 week battery i would be all over it but it's still early to own a smartwatch. I'm sorry Not trolling at all. This watch is not attractive at all! It's the second, maybe third best looking smartwatch behind the Huweii and Moto offerings. 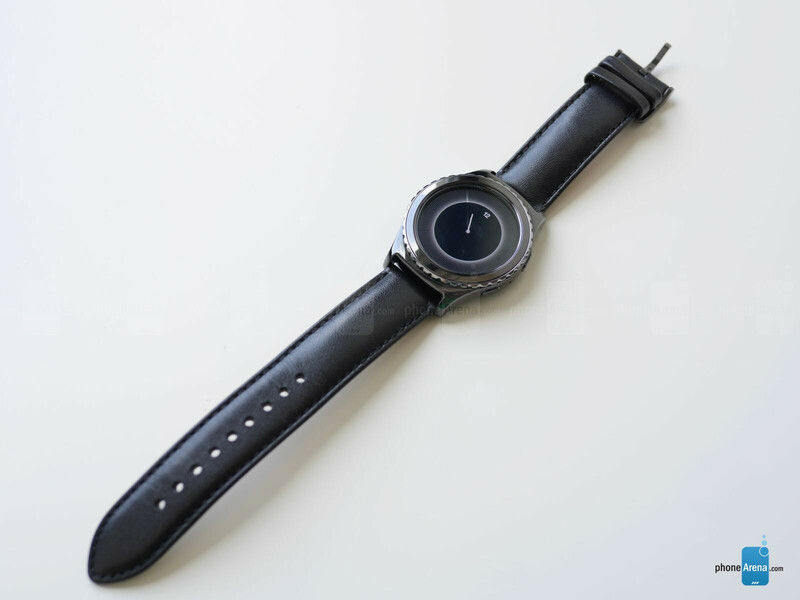 this is the first real smartwatch, it looks like a watch it feels like a watch and it's smart. Strange, for me, comparing to the new Moto 360 and the Huawei Watch this looks the least watch like, the more gadgety and the cheapest. Something like the Swatch of the smartwatches. I think the New Moto breaks almost every watch jewelry rule in the book. Sometimes that works but definitely did not work on the new Moto. The Huawei watch is super nice though. If the Huawei watch looked thinner it would take all look categories but this one looks super thin even though it's nit at 11.3. I think it uses some Rolex type tricks that hide the thickness. Samsung should have made it's own chip in 14nm, with better cores (4xA53) and new GPU, that would have made watch much more power efficient. Samsung could have also used new UFS 2.0 and DDR4 RAM (faster and saves energy). If Samsung would have gone full throttle, no other company could have matched it, even for next 2-3 years. Relying on same old SOC (DDR2 RAM, I guess), is not improving watch much further. That stock watch face is ugly. I am totally buying this one, perfect look and size it seems. Of course I planned to buy certain watches before that ended up not suiting be but I don't think I can pass this one up.